Estimated cost of material: $40,000, according to the building permit. The purchase price of the land in 1888: $40,000. Architect: Henry Edwards-Ficken, of New York. 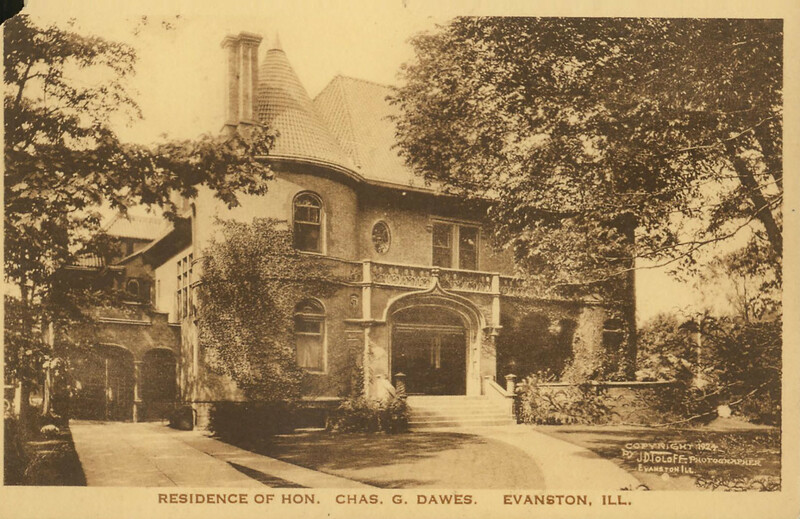 The Coach House architect was Clinton J. Warren. Original owner/occupant: Rev. Robert D. Sheppard D.D., Treasurer and Business Manager of Northwestern University and Garrett Biblical Institute. Purchased from Sheppard by Charles G. Dawes in 1909 for $75,000. House Description: Varicolored orange and tan brick exterior with red sandstone trim, three and one-half stories, ceramic tile (terra cotta) hip-roof. Number of rooms: 25. 6 bedrooms, 7 bathrooms and 13 fireplaces (12 of which survive). First Floor: great hall, east parlor, west parlor, library, dining room, 1/2 bath, kitchen, day room and butler’s pantry. Second Floor: family and guest bedrooms, den, bathrooms. Third Floor: four servants’ bedrooms, 1 bathroom, ballroom with stage and dressing room, billiard room and storage rooms (The third floor, which is used for storage, is not open to the public). Coach House: The coach house is adjacent to the main house. It originally included four horse stalls, two cow stalls and servant’s quarters on the second floor. It was designed by Clinton J. Warner and was built in 1892-93. The upstairs area is now rented as an apartment, and the lower level is used for storage. The conservatory: Once attached to the main house, the conservatory was razed before 1960 due to structural problems. A greenhouse, once attached to the coach house, was razed in 1941.